Critics gripe about formulas. We can’t help it; it helps to give meaning to our vampiric existence to roll our eyes and point out how tedious it is that underdog sports movies, cinematic biographies, romantic comedies, etc. all thrive not by virtue of their inventiveness, but by virtue of how precisely they give us what we’ve seen before, and expect to see again. But, as Due Date reminds us, credit where credit is due: If ever there were a formula that has proven its durability, it’s the odd-couple road comedy. From It Happened One Night (and its more modern revisiting The Sure Thing) to Midnight Run and Planes, Trains and Automobiles, there’s something undeniably effective about throwing a pair of mismatched souls together on a cross-country journey of simmering loathing evolving into affection. And when those mismatched souls are Robert Downey Jr. and Zach Galifianakis—even when the structure supporting them is sometimes shaky—it’s hard to resist. First, we’ve got to manufacture a scenario by which our protagonists are stuck with one another, and director/co-writer Todd Phillips (The Hangover) comes up with a doozy. Architect Peter Highman (Downey) is returning to Los Angeles from a business trip in Atlanta; on the plane, he encounters Ethan Tremblay (Galifianakis), a weird would-be actor. One awkward conversation about terrorism later, Peter has been subdued by an air marshal, removed from the plane without his wallet, and put on a no-fly list. So with no ID or money, his only way back home in time for the scheduled C-section delivery of his first child is bumming a ride with someone else in a similar no-fly predicament: Ethan. 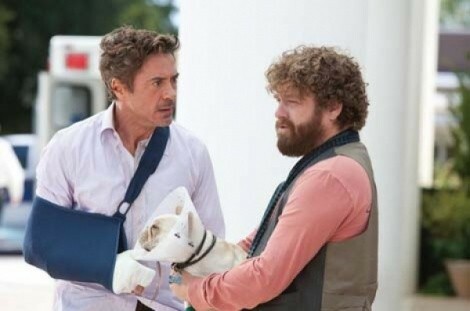 As is fairly typical of these scenarios, the tension in the pairing is created by teaming an uptight Type A (in this case, Downey’s Peter) with a more unpredictable free spirit (Galifianakis’ Ethan)—and there’s an almost instant chemistry in the way Peter takes a disliking to the spaced-out Ethan. It’s a different dynamic than, for example, Steve Martin’s workaholic businessman and John Candy’s eager-to-please traveling salesman in Planes, Tranes and Automobiles, but you can see Phillips working from a similar grab-bag of comedic scenarios: an automotive disaster that takes place while the responsible guy is dozing; failed credit cards that result in makeshift sleeping arrangements; and plenty of nonstop chatter from a guy who seems to be obliviousness personified, but harbors some inner pain. Of course, Phillips isn’t nearly the sentimentalist John Hughes was, which makes Due Date a slightly strange concoction. Despite Peter’s omnipresent Bluetooth earpiece in early scenes, Downey isn’t playing the traditional Guy Who Needs to Learn What Really Matters; he’s more afflicted with profound anger-management issues, presumably inspired by the tale he tells Ethan about being abandoned by his father. But Phillips doesn’t really turn Due Date into a neat-and-tidy learning experience for Peter, which winds up being both bracing and vaguely unsatisfying. We may not be able to predict exactly when Peter is going to soften and embrace his onetime nemesis, but we also can’t quite get a handle on the sweeping arcs of his emotional pendulum. Of course, that doesn’t matter nearly as much when you’re spending 90 minutes in consistent bursts of laughter. Galifianakis gets to play most of the truly outrageous and absurd moments—whether it’s casually masturbating himself to sleep in the passenger seat next to Peter, or doing the world’s worst “screen test” of a football coach giving his team a halftime pep talk—and he’s terrific in his naive obliviousness to the fact that other people operate under a different set of rules. But Downey also nails his best scenes, including Peter’s unconventional disciplining of an annoying child, and every time he needs to unload a litany of blistering threats to his perpetually irritating companion. It’s a bit of a disappointment that Due Date can’t build to a more effective climax, either from a comedic or an emotional standpoint; it feels more like it’s running out of steam than coming to a conclusion. But what happens on the way to that ending shows that odd couplings are still comedy gold. Two talents like Galifianakis and Downey probably would have had to work harder to make a time-tested concept like Due Date fail than they had to work to make it succeed.